a custom pair of boots since this pair are so hard to get a hold of!! M and F Western Product Men's Standard Belt in Brown Distressed Leather with Fancy Woven Back from the Top Hand Collection featuring current styling and durability. M&F Western Products is a worldwide manufacturer and distributor of western accessories. Being family owned since 1969, M&F Western Products has built its reputation on fast, consistent shipping of quality western accessories for over 30 years. M and F Western Product Men's Standard Belt in Brown Distressed Leather with Fancy Woven Back from the Top Hand Collection featuring current styling and durability. The manufacturer normally suggest that your belt size is 2 inches bigger than you waist size. For example a 32 inch waist normally uses a 34 inch belt. 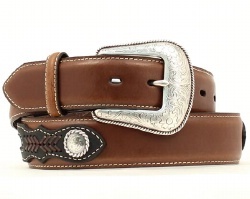 For odd size waists it is usually better to go 2 inches and round up unless you plan on replacing the original buckle with a large western buckle. In those cases 1 inch larger is normally fine. It is always a good idea to try on a new belt to confirm prior to ordering. M&F Western Products is a worldwide manufacturer and distributor of western accessories. Being family owned since 1969, M&F Western Products has built its reputation on fast, consistent shipping of quality western accessories for over 30 years.